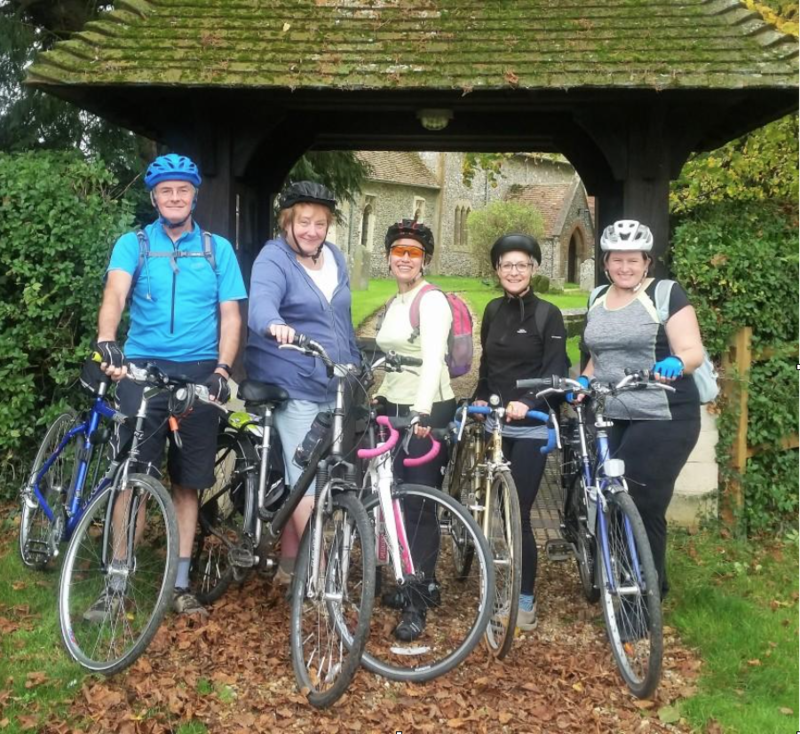 Ringers at St Michael’s Church, Basingstoke, have recently combined their pursuit of bellringing with an even more energetic challenge by completing a cycle tour of local towers to ring three Quarter Peals. A vague idea floated during the monthly ‘pub night’ led to myself, Steve Lutener, cycling all over the district, to see if it was feasible to pack three towers into a short day’s ringing, with cycling in between. Eventually a route was proposed, making light of the fact that one tower would be reached by a four mile climb. The other ringers –Lynne, Maggie, Sue and Helen agreed, and the towers were booked. With only five cycling ringers available (one of the original six, Pete Jordan had recently had an operation which temporarily curtailed ringing) arrangements were made for non cycling ringers to join them at each of the towers. The towers were all in the Basingstoke District: Wootton St Lawrence; All Saints, Hannington and St Leonard, Church Oakley. At Wootton St Lawrence, the five cyclists were joined by Richard Webb, a quarter of Grandsire Doubles was achieved. I chose this occasion to conduct my first quarter, but the celebrations had to wait as the bells had to be rung down prior to heading off to the second tower – up that hill! At Hannington, Alan Barsby, a visiting ringer from Eversley, joined the group to conduct. Alan is a regular at St Michael’s and can often be relied on to assist when needed. A quarter of Plain Bob Doubles was achieved and the cyclists in particular realised how hungry they were. The route had been carefully chosen – and the local hostelry ‘The Vine at Hannington’ was visited for lunch. Pete had volunteered to act as emergency mechanic and first aider and he joined the group for a sociable lunch. Discussion took place about how many calories had been expended in ringing the two quarters and cycling – and an appropriate level of restocking the energy levels took place. All too soon it was time to set off to the third tower – this time though the we looked forward to the steep downhill – with some banshee wailing adding appropriate sound effects. Yet another local ringer, Rebecca Webb joined the group to ring at the third tower. The bells at Oakley were the heaviest of the day (make a mental note for future tours that this may not be the best arrangement! ), and with what had gone before – they felt heavy. Unfortunately the quarter came to grief near the end, but we rang 1000 changes of Plain Bob Doubles. We then headed back home – having clocked up three hours of ringing and two hours of cycling including over 900 feet of vertical climbing. But that was not the end of their day – after much needed baths and showers, they would be heading out in the evening for the St Michael’s bellringers annual dinner. We discussed the three dedications that would be recorded – first, Pauline Underwood, one of the long standing ringers of St Michael’s had just celebrated her 80th birthday – and she is still very much an active ringer on Sunday mornings and practice nights. Secondly, Betty and Mike Rice, who ‘took up the ropes’ just a few years ago, had just celebrated their Golden Wedding. Last but not least, the group had agreed to commemorate, as part of the W&P Guild’s World War 1 project, the centenary of the deaths of five local servicemen recorded in the St Michael’s Book of Remembrance, who had died during September and October 1917. The photograph shows the cyclists after lunch, at Hannington where they rang their second quarter. They are, left to right: Steve Lutener, Lynne Jordan, Maggie Ellis, Sue Hunt and Helen Green. Photo by Pete Jordan. Rung to commemorate the sacrifice of those who lost their lives in the 1914 – 1918 war. Soldiers from the Basingstoke area, whose deaths are noted in St Michael’s, Basingstoke, Book of Remembrance during September and October 1917: namely Edwin Holton, Gordon Webb, Walter Pound, William Andrews and William Webb. Photo by Snaar Photogrpahy. Used by permission.